Advertisements for health products are numerous and widespread. 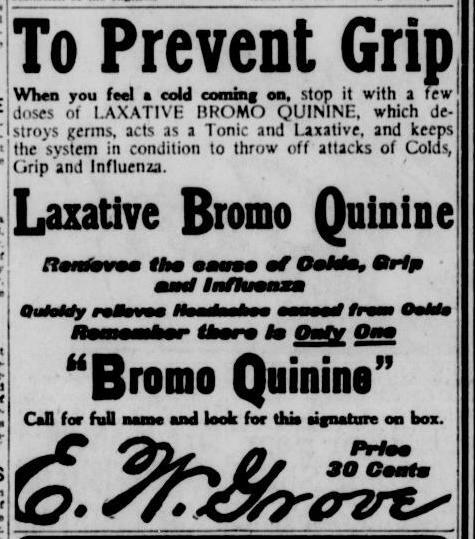 "Bromo Quinine," is found in many newspapers in all parts of the country. This one is from the Seattle Star. The laxative is promoted this winer for grip, influenza and colds, in other locations it has these and other capacities (to address blocks in drains). The newspaper is underwriting a Tobacco Fund for the boys. Bombs from German planes are falling on London, and in a local court case a "red" charged under the espionage act objects to their being Red Cross volunteers serving on his jury. Source: "To Prevent Grip," Seattle Star, Seattle, Washington, January 29, 1918. Page 2, Column 4.